Our heartfelt prayers go out to Dr. Kevin McGill, Immediate Past President of The International Ministers and Lay Association, on the passing of his dear mother. Please lift him and his family up daily. May his mother Rest In Peace. Our hearts and mind go out to Dr. Dwight B. Cannon, the A.M.E. Zion Church’s General Secretary Treasurer of Global Missions, on the loss of his father. May God’s loving arms bring his family even closer together and the light of His Word bring comfort. With the annual meeting for the International Ministers and Lay Association fast approaching, the association and I look forward to your safe arrival, participation, input and collaboration. I would like for us to collectively embrace the theme, “A Changing Church, but an Unchanging God.” Since the inception of our denomination, “Zion” has faced and met challenges without fail. Given the present condition of our society, our association continues to be called upon to be a guiding force in helping others witness the power of God at work, even in the midst of a plethora of things that attempt to overshadow progress that is being made daily. With a host of very important concerns on the heels of Legislative Summit held November 7-9, 2018, let us be poised to continue building upon a legacy passed down to us, while never forsaking the need to raise the bar to “serve this present age” faithfully. What an awesome time to express our continued love and dedication to the ideals that helped our association to be as great as it is. With God’s help, we will return home from Greensboro, NC all the more enthused than when we arrived. Looking forward our collective time of sharing. Banquet tickets may be purchased online, as well as through your Regional Vice President. Polk-Wright as the newly appointed Regional Vice President representing the Mid-Atlantic Episcopal Area. She is replacing Reverend Dr. Thomas Tucker who did a yeoman’s job for several years. God continues to bless our association with faithful and talented leaders. Our thoughts, prayers, and deepest sympathies go out to the Reverend Monica Marshall, Ms. Denise Niles, and to the entire Marshall family in the loss of one of Zion’s greatest pioneers, Rev. Dr. Calvin B. Marshall III. We definitely loved him but God loves you more. The International Ministers and Lay Association in collaboration with the Connectional Lay Council are excited that each of you may be joining us November 7-9, 2018 at the Kenneth Monroe Transformation Center for the Legislative Summit. The Summit is designed to serve as a special legislative prelude to the 51st Quadrennial Session of the General Conference of the African Methodist Episcopal Zion Church in 2020. The purpose is instructional pertaining to the legislative process, and the development of pertinent legislation which will help to strengthen our beloved Zion. The goal is to make significant progress in helping to craft legislation, in the same spirit that Apostle Paul directed the church in Corinth in 1 Corinthians 14:40, “but all things should be done decently and in order.” We anticipate a productive summit as we build consensus, collaborate and work through compromises resulting in proposed legislation that will transform and sustain Zion. 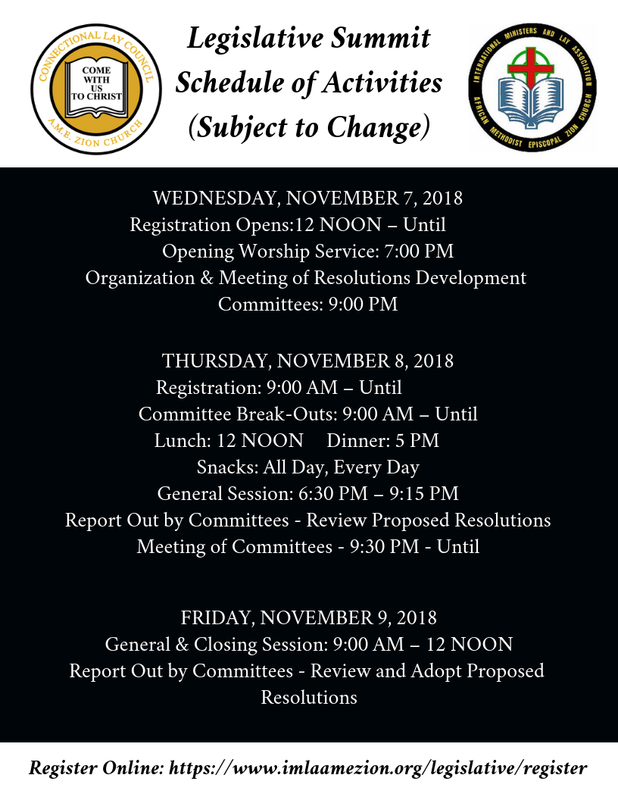 The Legislative Summit will be A-Political as committees will deal with every major aspect of the church, including brief presentations on General Conference Rules, Roberts Rules of Order, legislation geared towards our Children and Youth, Millennials and Young Adults, Social Justice and the role and responsibilities of potential delegates. With just a week out, Dr. Matthews, the Connectional Lay Council, The Ministers and Lay Association and I look forward to your arrival, contributions, talents and gifts which will be utilized to help bring to fruition God’s perfect plan. Persons who have yet to register may do so on-site in Rock Hill. God’s traveling mercies upon us all. Individual registrations include Healthy Churches 2020 Institute with Free CMEs, VIP Conference Opening Reception, Plenaries and Workshops, All-Conference Meals (Lunch & Breaks), Healthy Churches 2020 Prayer Breakfast, Best Practice Awards Dinner Featuring Grammy award-winner Regina Belle and a Closing Performance by renown Gospel Recording Artist JJ Hairston. 1) Learn from some of the nation’s top public health and faith leaders about the future direction of health care for African Americans. 2) Experience A Soul-Stirring 3 1/2 days – Cutting Edge Health Education! Great Preaching! Cardio Party! The Legislative Summit is fast approaching. We are looking forward to an intensive and productive legislative development effort in the life of our church. Our charge is to work collaboratively to craft legislation that will positively impact the administrative discipline of the A.M.E. Zion Church. We will gather from across Zion at the South Atlantic Kenneth Monroe Transformation Center in Rock Hill, S.C., November 7-9, 2018. If you love Zion, then make the sacrifice to come and participate in the process for improving the administrative practices and procedures of the A.M.E. Zion Church. Being fully aware that the process for dispatching resolutions flows through the Annual Conference Resolutions Committee, our task at the Legislative Summit will serve as a means to write and highlight IMLA sponsored resolutions that will be directed by persons who are associated with the selected Annual Conference Resolutions Committee. The process is outlined in The Legislative Flowchart (see page 339 2016 Book of Discipline). The IMLA sponsored Resolutions will no longer be directed through the Executive Board of the Connectional Lay Council, as was the previous practice. The Legislative Summit’s work is not intended to supplant the process that has been approved by the General Conference, but to offer opportunity for highlighting areas that may need addressing as well, which might ordinarily be inadvertently omitted. The summit provides an opportunity for representatives across the denomination to discuss in detail each resolution while simultaneously bring clarity to the Resolutions process as a whole. Dr. Mary Matthews, our planning team and I look forward to your presence, abilities, recommendations and time together in November as we work collaboratively to further aid Zion in being an even more cohesive and powerful “Freedom Church”. The call goes out now! Knowledge of the damage resulting from Hurricane Florence and the rain thereafter abounding, we as a Connectional Church will respond to the well documented need. A changing church, but an unchanging God. (A special appeal to the steadfast and faithful member of the 51st Quadrennial Session of the General Conference of the African Methodist Episcopal Zion Church). The International Ministers and Lay Association in collaboration with the Connectional Lay Council invite you to the Legislative Summit which will be held November 7-9, 2018, at the Kenneth Monroe Transformation Center, 745 Saluda Street, Rock Hill, SC 29730. The Summit is designed to serve as a special legislative prelude to the 2020 General Conference. The purpose is instructional pertaining to the legislative process, and the development of pertinent legislation which will help to strengthen our beloved Zion. The goal is to make significant progress in helping to craft legislation, in the same spirit that Apostle Paul directed the church in Corinth in 1 Corinthians 14:40, “but all things should be done decently and in order.” We anticipate a productive summit as well as build consensus, collaborate and work through compromises resulting in proposed legislation that will transform and sustain Zion. We are encouraging all interested Zionites to attend this joint endeavor. Persons desiring to serve on any of the committees are urged to visit https://www.imlaamezion.org/legislative/register which list the same, or contact either Reverend Erich Shumake at 502-905-2956 (email: pastorshu1@hotmail.com) or Dr. Yvonne A. Tracey 704-637-8687 (email: ytracey@bellsouth.net). A planned Prayer Vigil by the Charlotte District is to be held Sunday evening at 5:00 PM at East Stonewall AME Zion Church to mourn, to support, to heal from the tragic accident on Sunday, June 17, 2018 as a group was enroute from the Annual Conference site in Greensboro to Charlotte. We appreciate very much your thoughts and prayers and calls to check on us since Sunday. For further information, please contact East Stonewall (Rev. Dr. Michael McLean or Sis. Rudi Washington). Our hearts, minds, and prayers go out to the families of Dr. Kathryn Brown and to Zion as we say farewell to our General Secretary of Christian Education this upcoming Wednesday. Words cannon express the loss, nor the void her passing leaves, but she leaves a memorable life of dedication, service and stellar leadership for us to model. Dr. Brown was a faithful supporter of the International Ministers' and Lay Association, even having attended our most recent banquet and sessions. Our association has been made all the better because of her. May I ask you to join with me and the family of Zion in providing her with a send off second to none, while simultaneously and collectively continuing to lift the banner of Christianity she so enthusiastically lifted, which has inspired so many. "When He shall come with trumpet sound, oh may I then in Him be found. Dressed in His righteousness alone, faultless to stand before the throne. On Christ the solid rock I stand, all other ground is sinking sand. All other ground is sinking sand." During the most recent ecumenical gathering of religious communions from around the nation, a historic moment in time was evidenced. This event was indicative of the movements that took place during Dr. King's time, as it once again reached across ethnicity, gender, creeds and various beliefs to provide a birds-eye view of the things we hold in common that unites us in God. Such could be seen, as thousands descended upon the National Mall April 3-5, 2018. Our commendations to Bishop W. Darin Moore and the National Council of Churches, USA for such an auspicious and memorable way to keep the legacy and dream of Dr. Martin Luther King, Jr. alive, as well challenge those of us who are still alive to continue to work for rights of the oppressed and others who cannot speak for themselves. Zion should be most proud to once again serve as a vanguard for others to model. This is nothing short of what we have learned from the days of the Harlem Renaissance; the Civil Rights Movement; the Black Power Movement; the Post Civil Rights Movement; the Black Lives Matter Movement; through years of protests, and definitely, as it relates to various pew reports, as pew reports tend to point out our inability to often times recognize/respond to an aging church. We are, in no-wise faced with less than our ancestors, but brought to an impasse to no longer ignore, as Bishop Walls states, “trends” that prompt us to address the “needs of the times.” God bringing us face to face with this is truly not by happenstance. Just as the Christian church continues to be called out, I believe so does our association. We are being asked if the status quo will continue to chart the course of the association’s future through stagnation, or will we embrace again the “mystery and wonder of God through the Holy Spirit” that inspired The Reverend Hilliard R. Jackson and a committed contingent of dedicated Zionites to recognize the changing trends, while simultaneously daring to speak out on behalf of the oppressed. They understood then, as we must understand now that oppression is not limited to class, race, gender and creed, but can also exist among the people of God who institutionalize others based on their own limited spiritual sight. The need to sense the divine presence of God; “ the mystery and wonder of God through the Holy Spirit”, if you will, once again brings us full circle with God’s desire to imbue us with the wherewhithal to step outside of our own sphere, and into a sphere that can only be understood through the eyes of the divine. “God is not dead, He’s still alive. And He’s still working miracle in our lives.” It is not by happenstance that the International Ministers and Lay Association is being called upon, not just for this moment, but for just as many and even more years in the future as it was in times past to, as Dr. Martin Luther King, Jr., reminds us, “recapture the sacrificial spirit of the early church”, seek to preserve its “authenticity”, while working without tire to never be seen as an “irrelevant social club with no meaning for this century.”[ix] It matters that we be and remain viable, vibrant, and vital. It matters that we be and remain bold, brave and battle ready with the help of God to break every chain that binds God’s people in Zion. 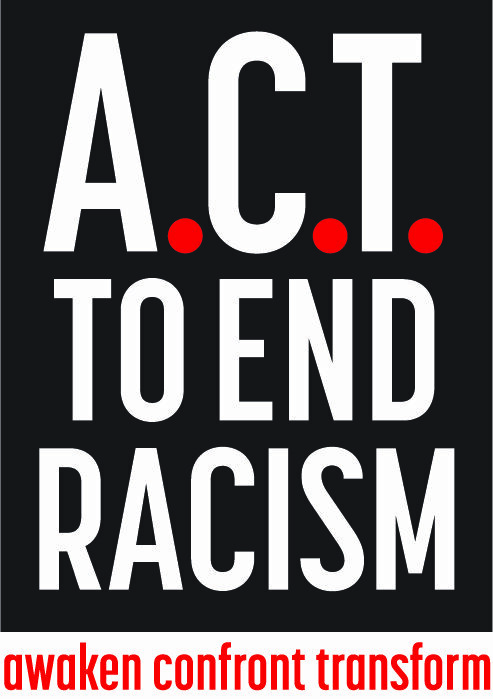 It matters that our association be prepared, prayerful and poised to speak out without fear against injustices throughout the world, for our morality and Christian principles hinge on the very existence of so many things that plague our communities. That which plagues our churches plagues God’s people, regardless of denominational dogma. It matters that our association be and remain faithful, fearless and forthright in taking up the weapons of justice, social justice, liberty and human rights of God’s people, which is exactly the evidence of “strongholds that are being pulled down” spiritually, daily. It matters that our association be and remain committed to being the voice for others who may not be able to speak truth to power for numerous reasons. There is power in the name of Jesus. There is power in the name of Jesus. There is power in the name of Jesus. To break every chain, break every chain, break every chain. There’s an army rising up. There’s an army rising up. There’s an army rising up, to break every chain. Break every chain. Break every chain. Support of and provide positive feedback of the association’s new website. Our goal is to make it even better than it presently is. Increase in memberships across generational lines by at least 30 percent this quadrenium. Establish effective mentoring groups to teach the significance of our denomination’s history, as well as help to develop seamless turnover that promotes the perpetuity of our association. The support of and purchase of the new association Lapel Pin. The goal is to circulate over 1000 pins throughout the denomination. That we embrace new and fresh ideas, while tweaking, sustaining and modifying those that keep us scripturally and doctrinally viable/relevant. Support our Regional Vice Presidents with helping to strengthen our areas with a cohesive intentional plan to bridge gaps across the denomination. To ensure the historical archives of our association continue to be chronicled accordingly and kept in a secure location to preserve the historicity for future association members. To keep the association members apprised of the issues impacting our Zion that fall under our purview. That we be transparent, accountable and trustworthy in every respect throughout our association. [vii] President’s Address delivered by Dr. Frank Jones during the Ministers and Lay Association which convened in New Bern, NC, February 20, 2008. [ix] Why We Can’t ait pg 92, by Dr. Martin Luther King, Jr.